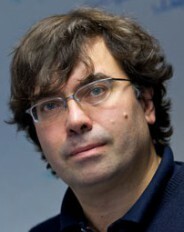 Nicola Marzari is the director of the NCCR MARVEL since May 2014. He joined EPFL in 2011, where he heads the laboratory for Theory and Simulation of Materials. Within MARVEL phase I, he was a group leader in Vertical Project 2 and in Platform Project 6. Since May 2018, he is the project leader of Design & Discovery Project 3 and a group leader in Incubator Project 1. Nicola Marzari has a "Laurea" degree in Physics from the University of Trieste (1992), and a PhD in physics from the University of Cambridge (1996). He moved to the US as an NSF postdoctoral fellow (Rutgers University, 1996-98), and then as a research scientist first at the Naval Research Laboratory (1998-99) and Princeton University (1999-01). In 2001, he was named assistant professor in computational material science at the Massachusetts Institute of Technology, where he was promoted to associate professor in 2005, and named Toyota Chair of Materials Engineering in 2009. After 10 years at MIT, Nicola Marzari joined the University of Oxford, as its first Statutory (University) Professor of Materials Modelling, and as Director of the Materials Modeling Laboratory.